PASTURED EGG SALE continues — Village Acres eggs are Buy One Get One 25% off! And the BUTTER BLOWOUT continues, too — Apple Valley Creamery’s grass-fed butter is on sale for $7/tub (usually $8.50). New products this week: From Pecan Meadow Farm a bunch of new pastured/grass-fed meats: chicken breasts (boneless/skinless), chicken legs & thighs, chicken wings, leg of lamb (special for Easter),and pork shoulders. From Wild Kombucha in Baltimore (this is different from Wild Water Kombucha who we have been and still are carrying), three kinds of booch — Watermelon Hops, Tart Ginger Cherry, and UpBeet. Also new, a beautiful baby red kale from Village Acres Farm. This guy was curious about what we were doing. Or maybe just hoping for some treats. This afternoon while Dusty was over at the market setting up for the week, he texted me, “Possibly make more Pecan Meadows price cards.” Right, I thought — we’re adding a bunch of stuff from them. And then I thought, “Wait, didn’t I just make a bunch of new price cards for them, after we visited the farm and I took some pictures?” And then I thought, “Nope. It’s still on my to do list.” So I went and found the pictures — I always kick myself for not taking more — and plunked them into my price card template and printed them out. And then I thought, you know, I’m not sure I ever wrote about the day we went to visit Pecan Meadow Farm. And then I went and re-read all the posts I wrote around that time to make sure that was true. So I’ve been meaning to tell you — back in October, we went to visit Pecan Meadow Farm, home of Daniel and Lois Shirk and their lovely kids, as well as the source of much of the meat we’re currently selling. Since the beginning of R&R, Dusty and I have had a policy that when it comes to meat, we want to source only from farms we’ve personally visited. In the case of Pecan Meadow, we made an exception because although we hadn’t visited firsthand, good friends of ours — whose judgment and knowledge about animal welfare issues we trust — had visited, and wholeheartedly endorsed what Daniel and family were doing there. But for many months, it remained on our to do list to go see for ourselves, and in October (more than six months ago now! how does that happen?! ), we went. And we were very happy with what we saw — happy chickens out on pasture; happy pigs rolling around in the mud (extra mud, really, since it was at the tail end of one of the wettest seasons on record); happy cows in lush green grass. I wish I remember more details now, and I’m kicking myself for not taking more pictures. Especially of the cows. I was especially impressed with their beef program — while poultry and pigs require supplemental feed that the Shirks buy in (all organically grown), they’re able to grow on their own land all the supplemental feed for the beef. Daniel enjoys experimenting with different crops and crop mixes for feed, and pointed out to us all the different things he had going that would become the feed that would get the cows through the winter when the forage is scarce. So, this week, we’re happy to introduce some additional cuts from Daniel’s farm — pieced chickens, boneless legs of lamb, and pork shoulders. I do have to let you know that we don’t know how reliable or steady the supply of these particular cuts will be over the next couple of months. At this time of year, the chickens are just starting to go out on pasture and the pigs are still small — it’s too early to process. In addition, pieced chickens are not really Daniel’s primary business, so while he has a moderate freezer supply of the cuts he’s shared with us, but we may not have the same selection every week. Come June, though, we should have a reliable source for whole and pieced chickens. Just this week we visited another farm which focuses exclusively on poultry, and, we think, will be able to supply us with everything we — and you — want as far as chickens go. We got to see the just-hatched chicks, the pasture and movable shelters where they’ll live in a couple weeks once they’re bigger and it’s warmer, and the on-farm facility where they’re processed. And farmer Stan Reiff sent us home with an assortment of birds to try for ourselves — Dusty’s downstairs roasting a chicken as I type. I’m looking forward to eating it. See that empty wine glass? Had to wait for the sweet potato to cool. Before I do, though — the other thing I’ve been meaning to talk about is to circle back around to the sweet potato challenge, because the original week I was going to, well, I ran out of time. That’s what’s about to happen tonight, too. But! Realistically, we probably have only a few more weeks of sweet potatoes. Maybe a month. 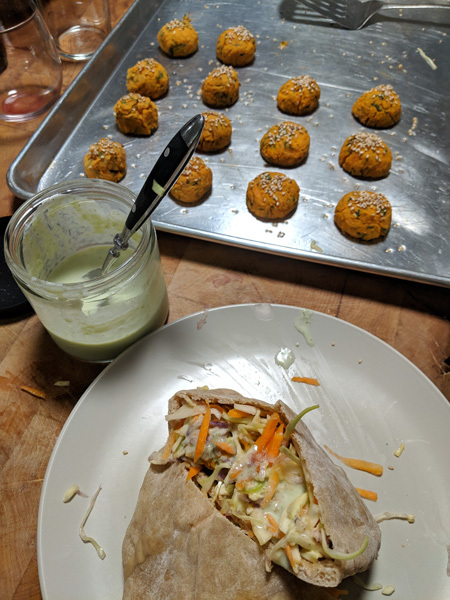 So I don’t want the season to slip us by without sharing one more thing I did, which was Sweet Potato Falafel. The recipe (you’ll have to scroll down a fair bit on that link) is from a British fast food chain, of all things, but it’s a fast food chain focused on healthy, natural, and seasonal food. I’ve never been (they do have one in DC recently opened), but I dig the idea, and the falafel seemed like a perfect thing to try. It was great! A little time-consuming if you factor in that you have to roast a sweet potato, wait for it to cool, and then make the falafel, but not at all labor-intensive, and it’s mostly passive time. You can totally fold laundry or drink a bottle of wine while you wait. A couple of clarifying notes just in case — “gram” flour is chickpea flour, and they sell it a the Green Ridge Acres bulk stand, so you don’t have to leave the market. And where they say “fresh coriander”, that’s what we call “cilantro”. (Did you know that coriander seeds are cilantro seeds? Did you know that we now sell ground coriander and ground cumin from Calicutts Spice Co?) And lastly, if I make this again, I will definitely definitely use sunflower oil instead of olive oil, which I think will actually work even more nicely with the flavors than the olive oil did. Anyway! We ate the falafels in pita pockets (Dusty made pita that week! ), and then ate leftovers with dollops of yogurt and smatterings of cilantro, and for one glorious quick snack I paired it with that Tait Farm Ginger Peach Chutney — awesome. I am now solidly out of time, and I haven’t even gotten around to all the things I really want to say about this week, like the egg curry I made, or the many times I ate what was basically spaghetti with lightly scrambled eggs and all the parsley, or how excited I am about THIS WEATHER. I also want to know about all the things you’re doing with eggs. Maybe we’ll talk at market!